Image Size: 28 X 21 in. Image Size: 45 X 34 in. The character and soul of California begins with the land, an expansive, diverse and verdant landscape blessed with a Mediterranean atmosphere. This magical environmental setting creates one of the world’s ideal grape growing locations. Nearly half of the wineries in the United States make their home here, and the wine country mystique is an essential ingredient of the California Dream. Spanish missionaries introduced wine growing grapes to the West Coast nearly 350 years ago. Vineyards have been in families for generations and this steady nurturing of the land has created a distinctive personality to California’s wine growing regions that is entirely its own. 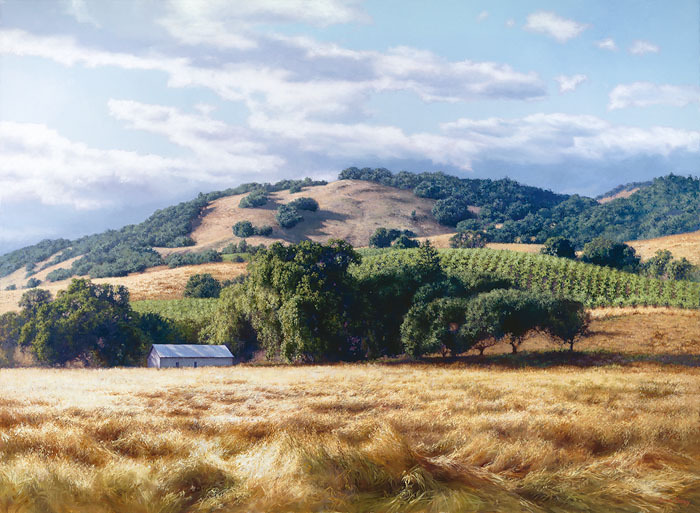 California Wine Country belongs to the extremely popular family of large-scale landscape paintings collectors clamor for: California Home, Alexander Valley Winery and September Gold. Like those, California Wine Country is available as an over-sized, 45” x 34” MasterWork Fine Art Giclee Canvas. Define your living or dining room’s appearance with that mystical California Wine Country ambiance delivered by this striking June Carey work of art.